Many patients suffer from significant damage to their smile and need comprehensive, full-mouth reconstruction. Dr. Robert Harrell uses multiple treatments at Adult Dentistry of Ballantyne to restore smiles, but dental implants are the best choice when it comes to restoring the appearance and function of missing teeth. Over the past decade, dental implants have emerged as the most important advancement in dentistry. 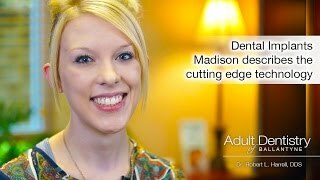 Permanent implant teeth are a vast improvement over traditional replacements such as dentures and bridges. Dr. Harrell has helped thousands of patients have healthy and bright smiles utilizing four types of dental implant procedures. Single dental implants are the most straightforward way to replace teeth. These prosthetic devices are the equivalent of an entire tooth — from crown to root. A strong metal post is inserted into the jawbone, serving as a solid anchor for the tooth. Once the post fuses with the bone, a permanent crown is placed. Dental porcelain is used to fashion the crown because it is both natural looking and extremely strong. For patients who are missing most or all of their teeth, the All-on-4 option is the perfect way to create a full set of beautiful, functional teeth. This procedure is similar to single dental implants in that it involves the use of surgical-grade titanium posts. The difference is four-to-six posts are used, strategically placed throughout the upper or lower arch. A metal bar spans across the posts and provides the attachment point for a set of custom-made teeth. These prosthetic teeth are much stronger than dentures, allowing patients to enjoy all the foods they did with their natural teeth. All-on-4 dental implants are considered permanent restorations because they can only be removed by dentists. The biggest drawback of dentures is that they can be unstable or loose-fitting in the mouth. If you have dentures and are experiencing this problem, denture stabilization is an excellent option for making your appliance more comfortable and functional. The process involves placing mini implants in the jawbone to which the denture be snapped on and off. Implant stabilized dentures are far more secure than traditional dentures. The procedure can be completed in one day, allowing patients to eat with their new denture as soon as they leave the office. 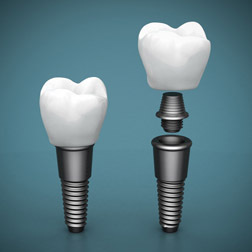 Dental implant bridges are a huge improvement over traditional bridges. Implant bridges are similar to single dental implants, except that multiple teeth can be replaced with only two posts. Unlike a traditional crown and bridge, which requires alteration of natural teeth to place a crown, implant bridges consist of two posts on either side of an edentulous (i.e., toothless) space. Replacement teeth then span the area and provide a more functional eating surface than with typical bridges. If you are missing one, multiple, or all of your teeth, Dr. Robert Harrell can offer numerous dental implant solutions to help restore your smile and your self-confidence. Just as important, you can once again experience the joy of eating, chewing and speaking without pain or discomfort. Dental implants do not require any special cleaning and can be brushed and flossed daily like natural teeth. The process of placing dental implants begins with creating a small hole in the jawbone beneath the area in need of a replacement tooth. Dr. Harrell then places a surgical-grade titanium post into the hole. The post has threads similar to those on a screw, making it easier for the surrounding bone to fuse with the post. This process, known as “osseointegration,” is given ample time to complete, although in some instances a crown can be placed on the same day. Regardless, dental implants are topped with a porcelain crown. Combined with a solid anchor within the jaw, these types of crowns give patients full use of their new tooth. In fact, the function and appearance of dental implants is nearly identical to that of natural teeth. In some cases, sufficient bone mass for placement of the titanium post may not be present in the jaw. Dr. Harrell can perform procedures that increase the bone density and create an ideal substrate for placing dental implants. There are several dental implant variations that can be beneficial in a full-mouth reconstruction. Several teeth can be replaced with only two posts, or an entire arch of teeth may be seated on only 4 posts, a method known as “all on 4.” Finally, dental implants can be used to create far better dentures, including those which easily snap on and off. When it comes to full-mouth reconstruction, dental implants are the most powerful tool for restoring your smile. Dr. Harrell has placed countless implants and has helped patients reclaim every aspect of their smile, from function to appearance. If you are ready for a happier and healthier lifestyle, call (704) 541-9888 today to schedule a free, no-obligation smile consultation with Dr. Harrell. During your consultation, a complimentary digital smile preview (an $85 value) will be created to show how you will look when your treatment is complete. 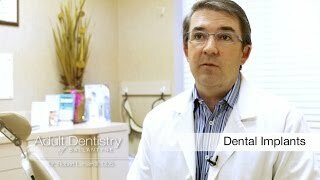 Adult Dentistry of Ballantyne is a “no judgement” practice. Whatever the current condition of your smile, we would love to meet you. Once we’ve assessed your needs, we can create a plan to give you the brilliant new smile you deserve.